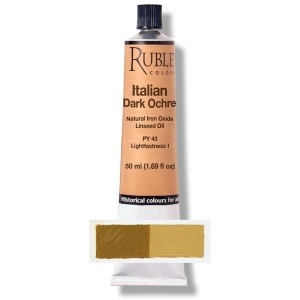 Details Rublev Colours Italian Dark Ochre is a semi- transparent yellow with good tinting strength, medium grained that makes pale biege half tints. Our yellow earth is quarries in Northern Italy. Hydrated iron oxide is the principle coloring agent in yellow ochres. This color is based on the natural mineral goethite associated with varying proportions of other minerals such as clay, chalk and silica. They differ from other ochres in that they contain water. In other words, the iron to which they owe their color is hydrated iron oxide. Natural yellow ochres are opaque, absolutely permanent and have good covering power.